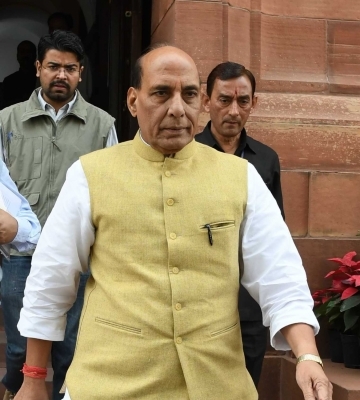 New Delhi July 13 (IANS) Union Home Minister Rajnath Singh on Friday left for a three-day visit to Bangladesh to discuss various issues such as anti-terror cooperation and the Rohingya refugee influx an official said. "Leaving for Dhaka on a three-day visit to Bangladesh. The relationship between India and Bangladesh is anchored in history culture language and shared values of democracy. India attaches great significance to ties with Bangladesh " Rajnath Singh tweeted before the visit. He said the two countries have made notable progress in transforming land and maritime boundaries into zones of peace. "Looking forward to strengthen the bilateral relations between both the countries on the basis of friendship and trust " he said in another tweet. During his visit the Home Minister will meet Bangladesh Prime Minister Sheikh Hasina and discuss various issues with her. Rajnath Singh who is accompanied by senior Home Ministry officials in his meeting with Bangladesh Home Minister Asaduzzaman Khan will discuss anti-terror cooperation cross-border trade and other issues such as illegal immigration and smuggling of cattle arms and ammunition narcotics medicines and fake Indian currency through the porous 4 096-km border. He is likely to raise the Rohingya refugee issue and attacks on Border Security Force personnel by criminals based in Bangladesh.